Hollywood Choirs is a knockout choral library for movie and game composers. Built on 59GB of 24-bit multisamples of separate male and female choirs, and running in version 6 of EastWest’s own Play engine (plugin and standalone), Hollywood Choirs is evidently targeted at the professional composer market, and even the most cursory of explorations quickly reveals it to be an incredibly high-quality choral ‘construction’ tool. The basic patches consist of 36 vowels and consonants for each gender, including staccato, legato and vibrato options, plus breath and unpitched consonants. Consonants have two dynamic layers, while vowels have three, and the mod wheel is used to crossfade between them. The Main 13-mic array can be broken down into Close, Stage, audience-perspective and ambience mixes for discrete levelling and panning. The recently improved WordBuilder phrase design interface is quite remarkable. Load the Male or Female WB Multi preset, type in some text for conversion to Phonetic and Votox (or enter either of those two formats directly), and the engine will do a generally very impressive job of having the choir sing it back to you, stepping through the constituent syllables with each new note. 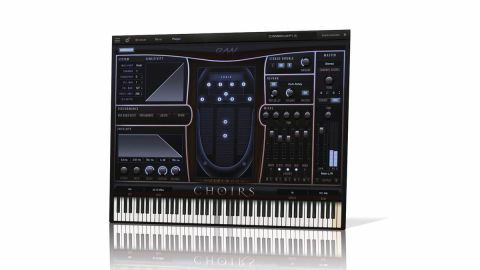 It’s by no means perfect - as expected - but the system offers deep manipulation and balancing of letters, syllables and phonemes, and with a bit of work it really is possible to get your virtual choir singing intelligible phrases. A useful library of preset lines in English, Latin, Italian, Spanish and German is included: “Blood will run”, “Listen to the wind”, er, “Necromancer drinks from the heart of darkness”… that sort of thing. The lack of solo choir sections is a negative - it’s very much all or nothing in that sense - and manually combining vowel and consonant patches across multiple channels isn’t the fastest of workflows when not using WordBuilder, but Hollywood Choirs is still a knockout choral library for movie and game composers. The less expensive ($665) Gold version is also worth considering while you’re there, incidentally, offering just the main mic mix at 16-bit quality in 8GB of samples.